Who needs the cloud when you can have two terabytes of storage in the palm of your hand? 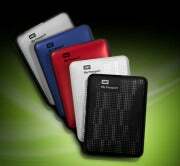 That's what Western Digital offers with its latest line of Passport portable drives announced Tuesday. The new drives are offered in four capacities--500GB ($129.99), 750GB ($149.99), 1TB ($199.99) and 2TB ($249.99)--and five colors--white, black, silver, blue, and red. Along with massive storage, the new drives include software for backups and security. The WD SmartWare software can be configured for backups that are automatic and continuous­--when you change a file, it's immediately altered in the backup on the drive. WD Security can password-protect the drive and encrypt the data on it. Western Digital also says that it has improved the casing for the portable drive line, which makes it more resistant to scratches and fingerprints. To achieve 2TB, Western Digital uses four 2.5-inch platters, which pack in 500GB of data per platter, in a 15mm z-height drive. That means you won't be seeing this drive in a laptop anytime soon; laptops typically have accommodation for a 9.5mm z-height hard drive. The company's current 1TB drive uses only three platters. The 2TB drive measures 4.4 by 3.2 inches, and support USB 3.0. Western Digital is one of the largest producers of hard drives in the world. It recently purchased the assets of Hitachi Global Storage Technologies after agreeing with the U.S. Federal Trade Commission (FTC) to sell off some of its hard drive assets to Toshiba to address anti-competitive concerns of the agency. Without the agreement, the Hitachi purchase would have made Western Digital one two companies controlling the worldwide market for desktop hard drives.